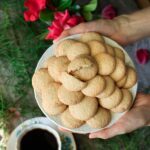 4 ingredient gluten free ratafia biscuits are easy, low carb cookies made without wheat flour and dairy. Traditionally from Scotland, these crisp and chewy cookies are perfect in a trifle or with a cup of coffee. This recipe was originally published on April 17, 2018. Have you ever heard of ratafia biscuits? They’re a crispy-chewy almond cookie from Scotland and are commonly used in trifles or served as an after-dinner snack with coffee. Another great feature of these cookies are that they’re gluten free and only take 4 ingredients! 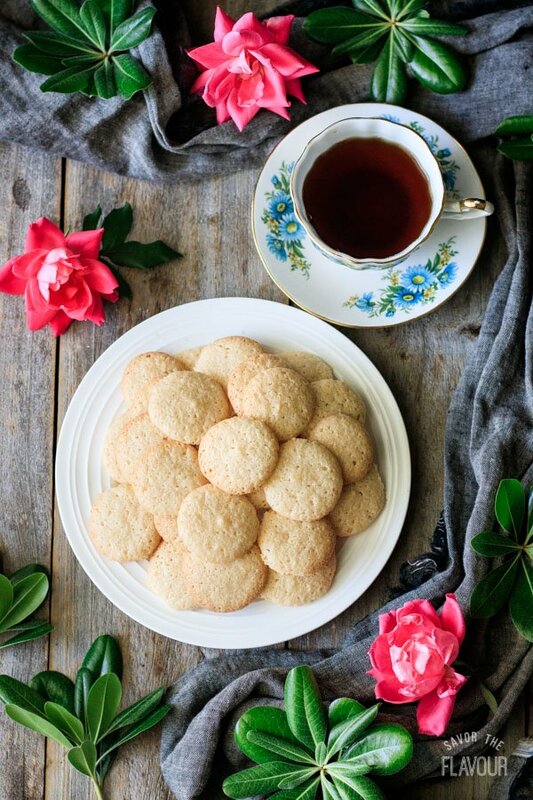 Ratafia biscuits are crispy and chewy almond cookies from Scotland. What do ratafia biscuits look like? Ratafia biscuits are small round biscuits with little air holes in their surface. What are ratafia biscuits made of? 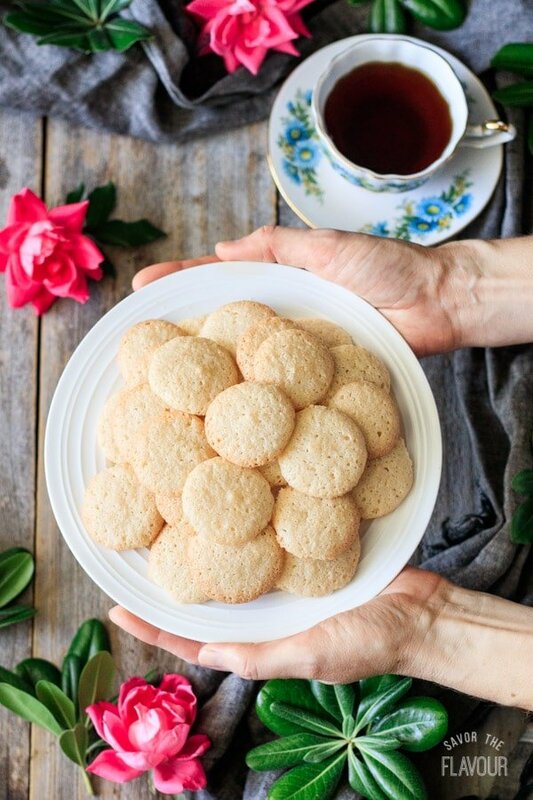 Ratafia biscuits are made from 4 simple ingredients: egg whites, almond flour, caster sugar, and almond extract. 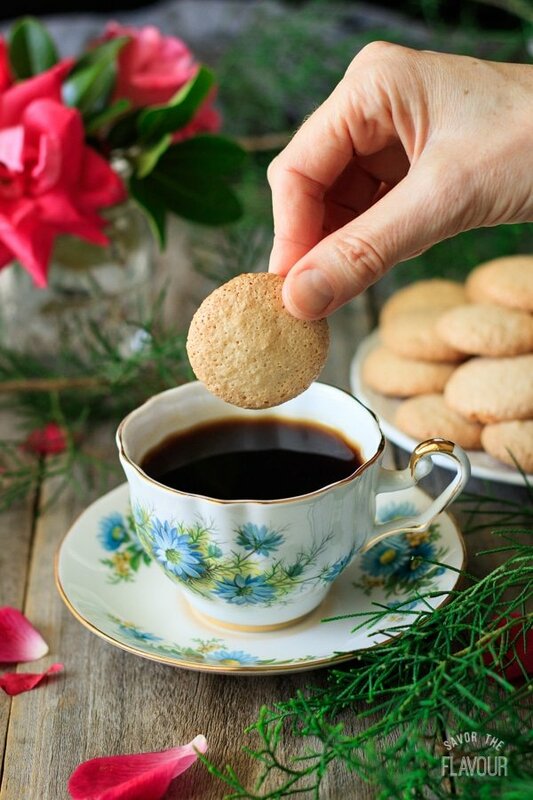 Are ratafia biscuits gluten free? Yes, ratafia biscuits are gluten free. If you’re really sensitive to gluten, make sure you use products that are certified gluten free. Are ratafia biscuits easy to make? Yes! Ratafia biscuits are one of the easiest kinds of biscuits to make–no fancy measuring, chilling, or rolling involved. Teens can easily make these biscuits by themselves. What do you use ratafia biscuits for? 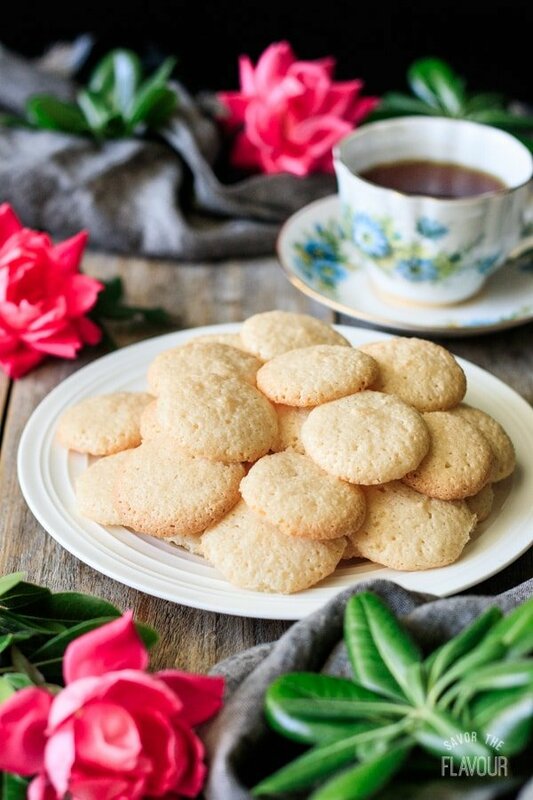 Ratafia biscuits are used for trifles or as a snack at afternoon tea. What can I substitute for ratafia biscuits? 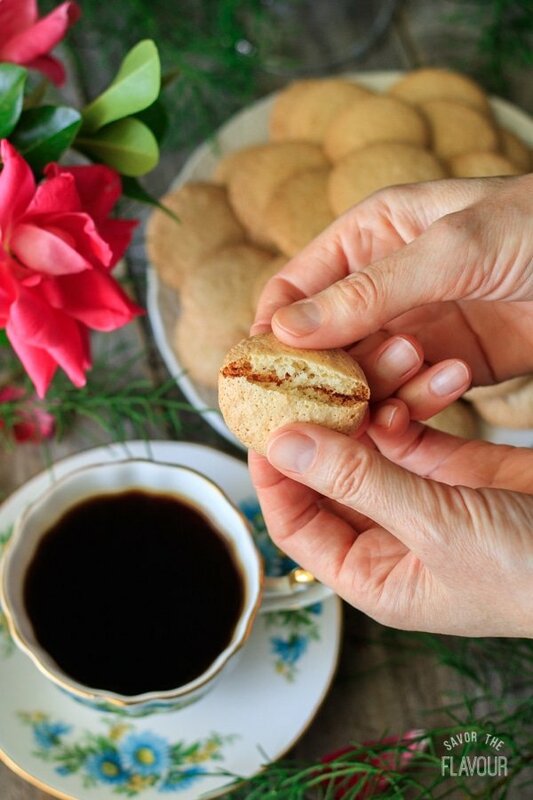 Amaretti biscuits are the most similar biscuit to ratafia. 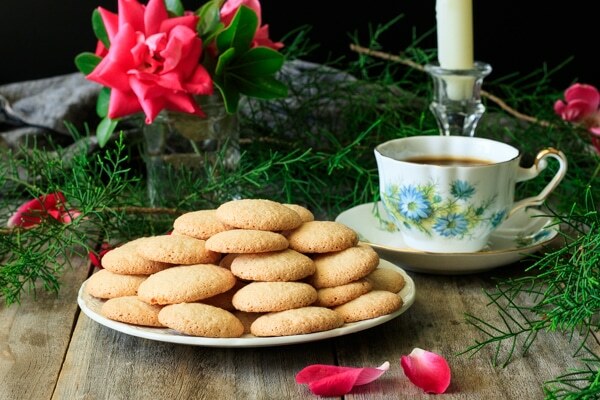 Amaretti biscuits and ratafia biscuits are very similar and contain almost identical ingredients. Amaretti biscuits are from Italy, while ratafias are from Scotland. Amaretti biscuits are thicker than ratafia biscuits. Amaretti biscuits usually contain amaretti liqueur. Keep them on a plate tightly covered with plastic wrap or a metal biscuit tin. Store them at room temperature; there’s no need to refrigerate. Since these aren’t wheat flour based biscuits, you don’t need to put a piece of bread in the biscuit tin to keep the cookies soft. The pleasure of a 5-star review for these ratafia biscuits would be greatly appreciated. 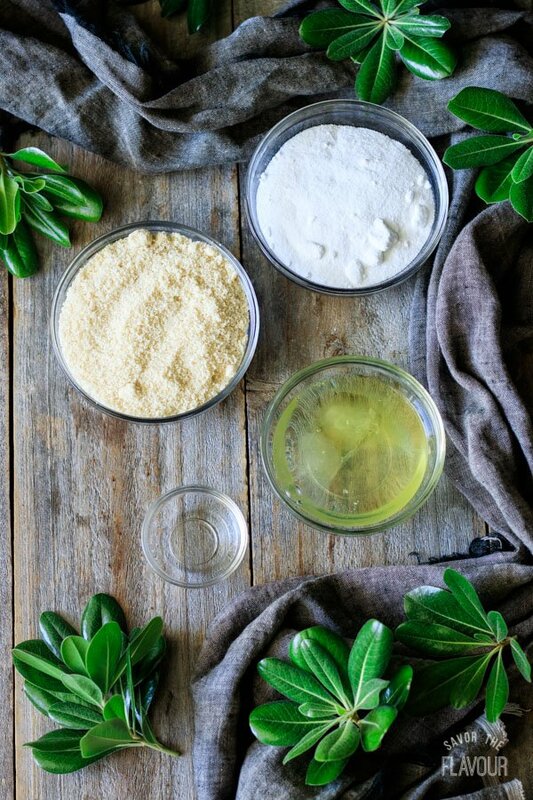 Gather the ingredients: egg whites, almond flour, caster sugar, and almond extract. 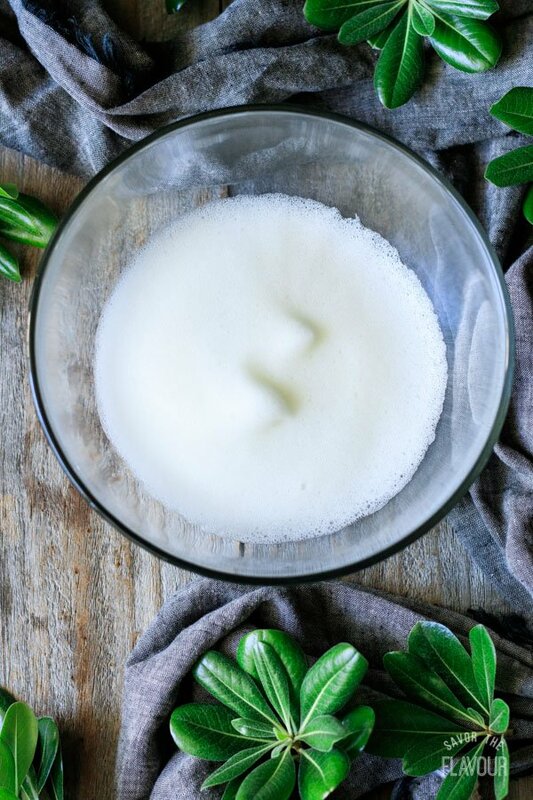 Whisk the egg whites by hand or an electric mixer until they form soft peaks. Sift the almond flour and caster sugar on top, then gently fold it in with a flexible spatula. Stir in the almond extract. The batter should look like a thick paste. Dump the mixture into a piping bag fitted with a 1 centimeter round tip. 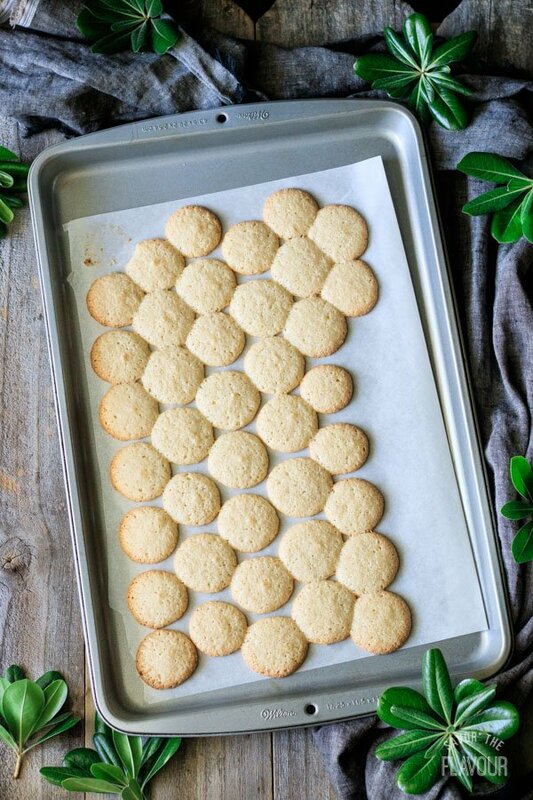 Pipe onto a large, parchment-lined baking tray, leaving an inch or two between each biscuit. They will spread as they bake, and you don’t want the sides to touch. Bake at 325 F (162 C) for 15-20 minutes, until golden around the edges. Let cool on the baking tray, then peel off the paper. Use room temperature egg whites. Cold ones won’t whip to the same volume. Want to warm up the egg whites quickly? Soak the whole eggs in hot tap water for 10 minutes, then separate the yolks and whites. Be careful not to overbeat the egg whites, or they will be dry. Use caster sugar, not granulated. Make your own caster sugar by grinding granulated sugar in a blender or food processor until fine. Can’t find almond flour? Substitute it with equal volume of another nut flour, such as hazelnut. Fold in the dry ingredients. Run a flexible spatula around the rim of the bowl, then cut through the center of the mixture. Repeat until evenly mixed. Don’t skip the parchment paper. It acts as an insulator for the cookies and prevents them from sticking. Want a crispier biscuit? Bake for a few minutes longer. Let the ratafia biscuits cool completely before removing from the parchment. Otherwise, they’ll stick to the paper. If you’re a fan of almond flavored desserts, this is one recipe you’ll need to try. It’s hard to stop eating these biscuits! Looking for more gluten free desserts? You’ll want to pin these ones! Indulgent Chocolate Mousse: a low-carb dessert that’s ready to eat in about an hour. Flourless Chocolate Roulade: a 6-ingredient chocolate cake that will impress your family and friends. Homemade Peppermint Bark: a super easy dessert with rich chocolate and minty crunch. The pleasure of a 5-star review of these ratafia biscuits would be greatly appreciated. 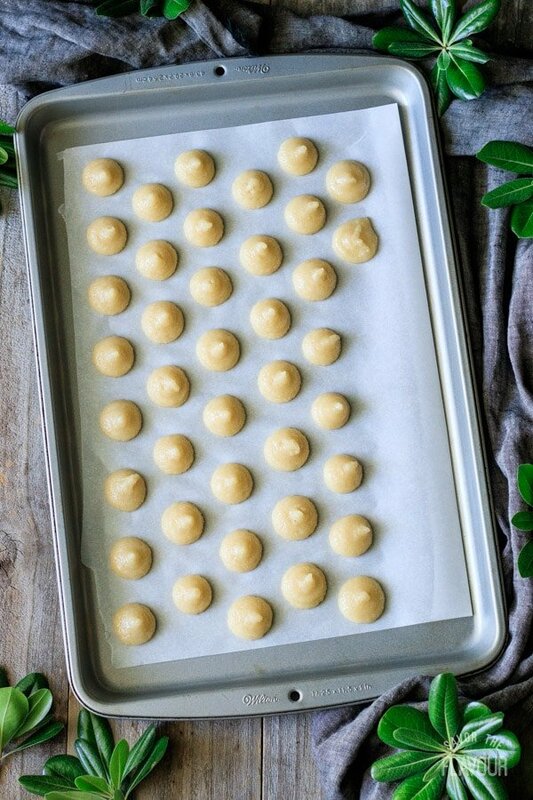 Preheat the oven to 325 F and line an 11×17-inch cookie sheet with parchment paper. Whisk the egg whites in a medium bowl until they’re quite foamy, but not forming peaks. Dump in the sugar and almond flour and beat until well mixed; then stir in the almond extract. 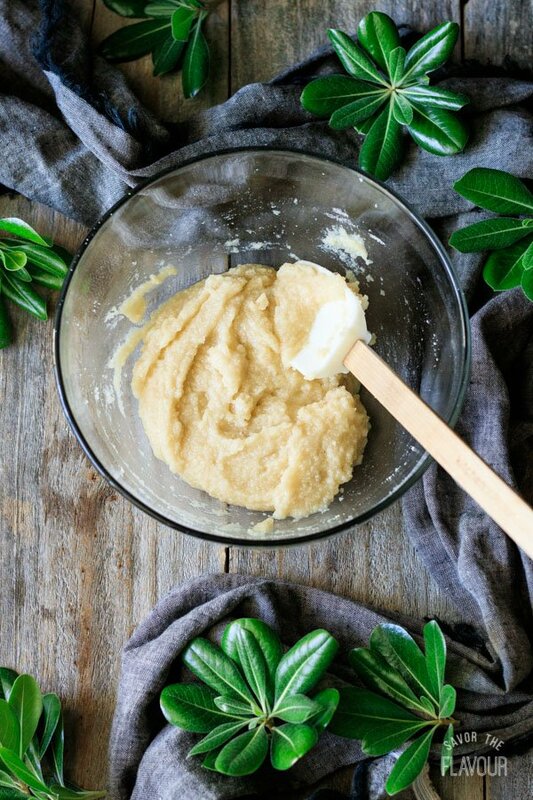 The mixture should look like a thick paste. Spoon the mixture into a piping bag fitted with a 1/3 inch (1 centimeter) round nozzle. Pipe blobs of the mixture onto the prepared tray about 2 inches apart, making each biscuit about 3/4 inch in diameter. Bake in the middle of the oven for about 15-18 minutes, until the biscuits are a pale golden brown around the edges. Let the biscuits cool completely on the parchment paper. Use in a trifle or serve as an after-dinner snack with coffee. Store leftover ratafia biscuits in an airtight container. Make your own caster sugar (also known as superfine sugar) by grinding granulated sugar in a blender until fine. To make a slightly sweeter biscuit, add an additional 2 tablespoons (25g) of caster sugar. The pleasure of a 5-star review of this ratafia biscuit recipe would be greatly appreciated. I love cookies with almond extract and these are no exception! Absolutely delicious! Yes, we love almond cookies too! These chewy cookies are so nice for dipping into tea, or even eating them plain. They are so golden and have a strong almond flavor. I love to eat these cookies! Thank you, Beth! Ratafia biscuits are so fun to eat. Ratafia biscuits are quite good and chewy. They have a good almond taste!